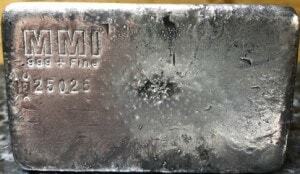 This page contains our current information on 20oz and 25oz class Engelhard silver production bars and Legacy Ingots. 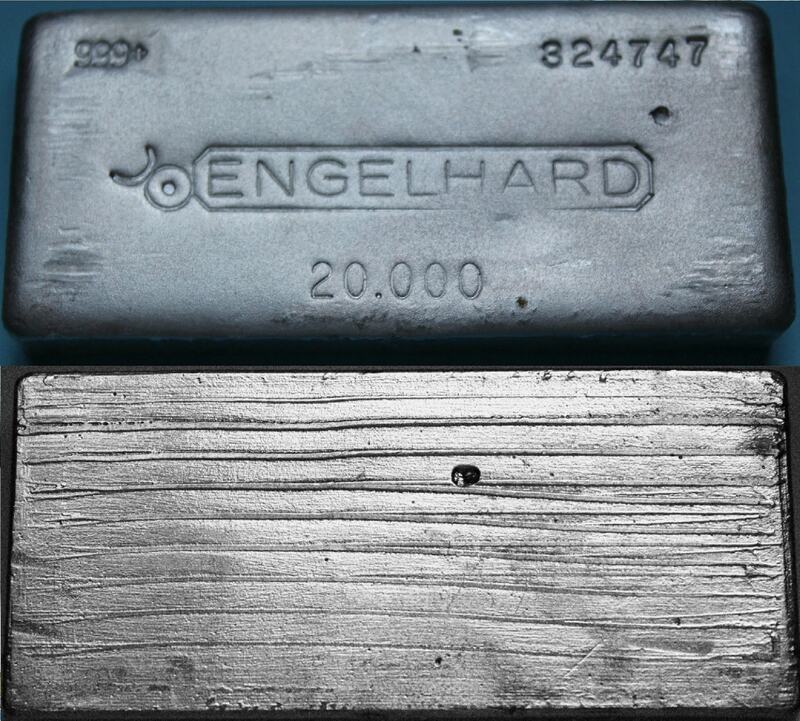 The 20oz Engelhard ingot is considered by many collectors as one of Engelhard’s most appealing pieces, as its large flat surface area beautifully displays the various stampings and hallmarks, while the relative thinness of these ingots accentuates the cooling lines in production creating beautiful and unique toning and patina. 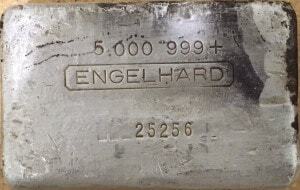 We believe total 20oz production to be less than 15,000 ingots, and without doubt many were melted over the years. Note that many 20oz varieties are Tier 1 and Tier 2 classified ingots. Please see our 20oz and 25oz Counterfeit Registry pages for additional information. 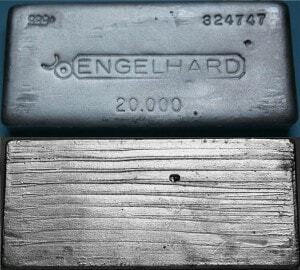 The 25oz Engelhard ingots are uncommon and all varieties are considered very rare and desirable for collectors. We estimate total mintage of all 25oz varieties to be less than 3,000 ingots, many of which were also melted over the years. 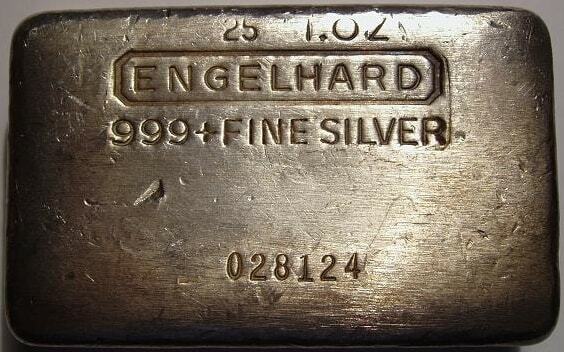 All 25oz examples are Tier 1 classified with exception of the 1st series example, a highly desirable Tier 2 ingot. 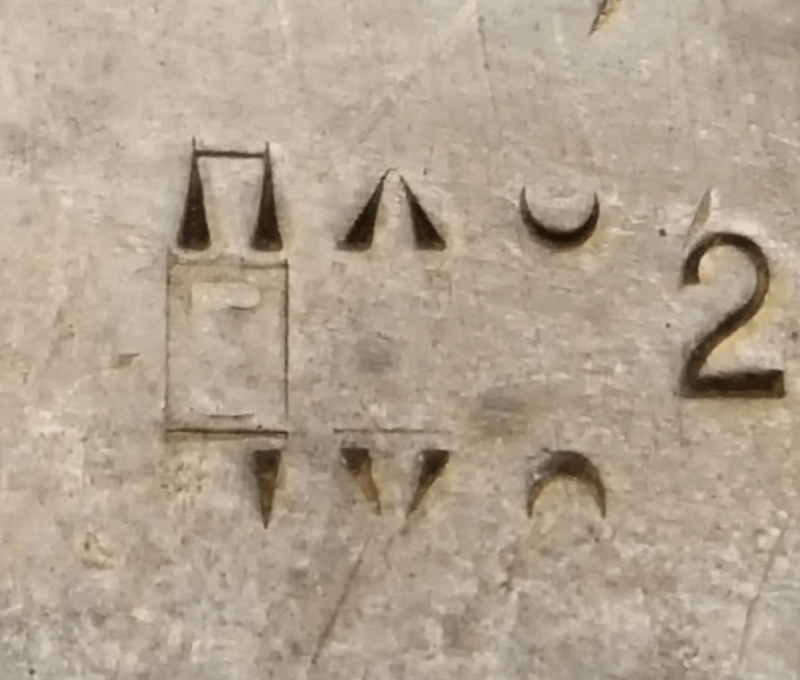 20oz Mid Hallmark [999+] [Serial Number] [Bull Hallmark in Elongated Octagon] [20•000] Cast Finish 7th series 20oz ingot in Canadian variation, demonstrates smaller stampings than earlier series, depicted above. Ingots 177000 – 181200+/- demonstrate an erratic ‘scribble’ reverse pattern, depicted in the middle photo, with estimated mintage of <4,000 examples. Ingots between 200000 – 200300 demonstrate a reverse and edge waffle-like pattern consistent with 10oz Canadian 3rd series CDN, bottom photo, with estimated mintage <300 examples. All Engelhard was appreciative to find this random commentary regarding the 186528 example pictured, at this LINK. 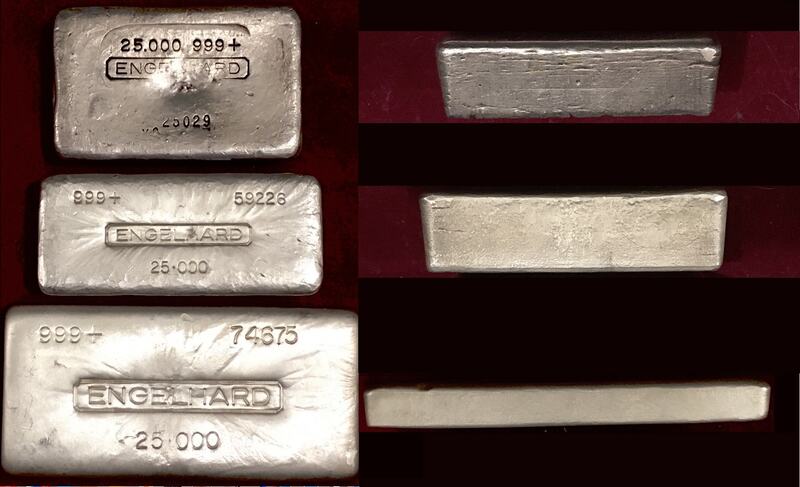 20oz Mid Hallmark [999+] [Serial Number] [Bull Hallmark in Elongated Octagon] [20.000] Cast Finish 8th series 20oz ingot in Canadian variation, demonstrates smaller serial number font than our example, below. 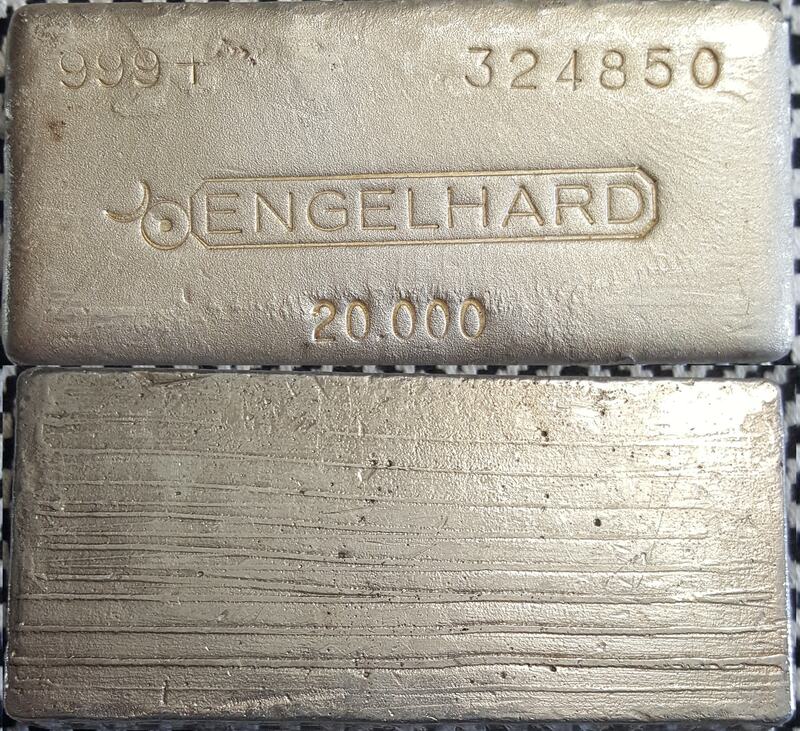 20oz Mid Hallmark [999+] [Serial Number] [Bull Hallmark in Elongated Octagon] [20.000] Cast Finish 9th series 20oz ingot in Canadian variation, demonstrates larger purity and serial number font than our example, above. 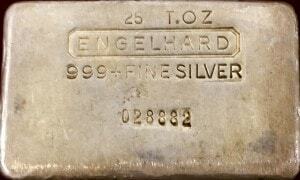 Also includes non-floating weight decimal and center hallmark that is unique, in that it matches only the 3rd series Canadian kilo ingot. 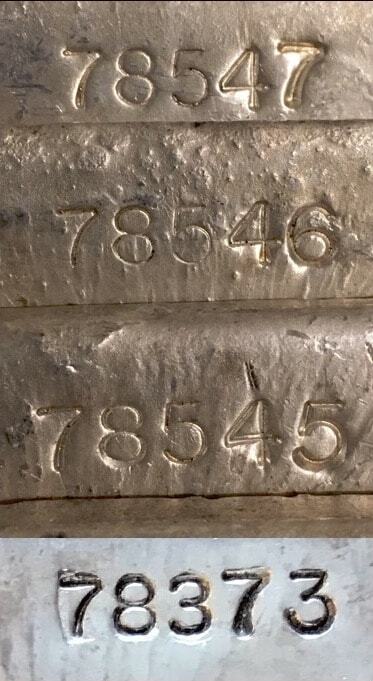 Some ingots were produced in large serial font, as pictured, although otherwise identical in character. This is a late production series, measuring approximately 4″ in width and a striated reverse finish. 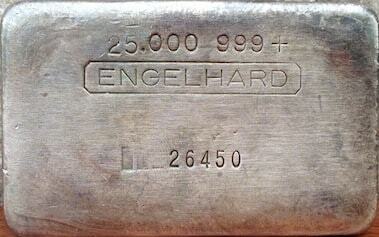 Hallmark [25.000] [999+] [Hallmark in Elongated Octagon] [Serial Number] Cast Finish 1st series 25oz ingot. Seen with hallmark size variation in later produced examples. Ingot 25256 is known to lack the ‘2’ prefix on weight stamp, also pictured. 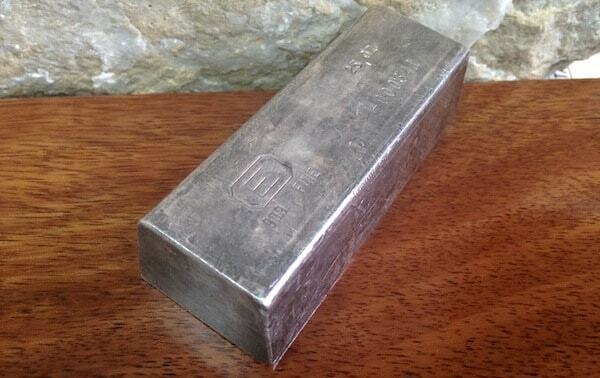 Ingot 26343 sold via eBay auction on May 21, 2016 for $1,147.40, nearly 3x spot at the time. 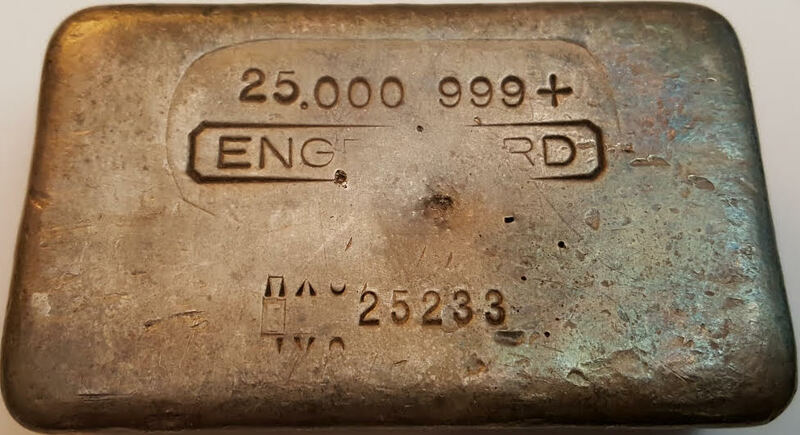 250z Mid Hallmark [25.000] [999+] [Hallmark in Elongated Octagon] [Serial Number] Cast Finish 1st series 25oz ingot in ‘HX’ serial prefix variation. 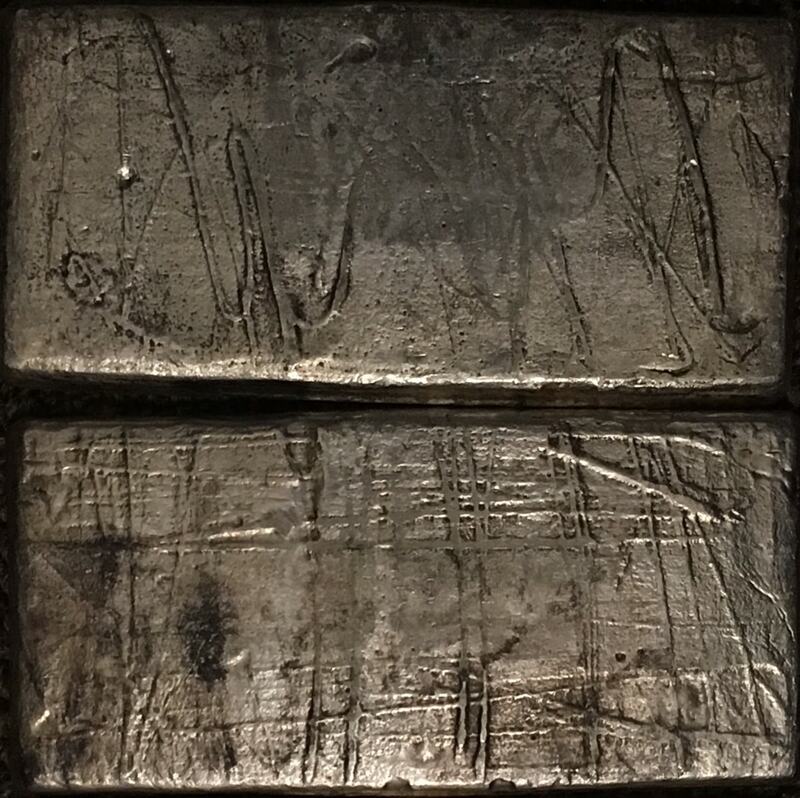 25oz Mid Hallmark [25.000] [999+] [Hallmark in Elongated Octagon] [Serial Number] Cast Finish 1st series 25oz ingot in ‘Y9′ serial prefix variation. 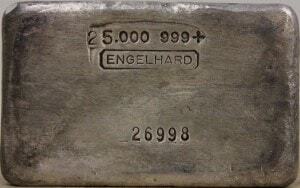 25oz Mid Hallmark [25.000] [999+] [Hallmark in Elongated Octagon] [Serial Number] Cast Finish 2nd series 25oz ingot. This example demonstrates a smaller hallmark and slight weight/purity font size variation as compared with 1st series, above. 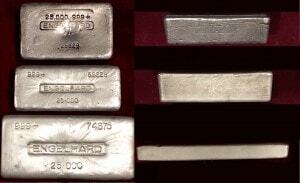 Some ingots include a ‘0’ leading serial prefix. 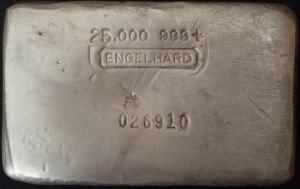 25oz Mid Hallmark [999+] [Serial Number] [Hallmark in Elongated Octagon] [25•000] Cast Finish 5th series 25oz ingot, last ingot of increased height casting dimension that closely matches height of earlier series 25oz ingots.Possible Canadian variation due to floating decimal on weight stamp and placement of purity stamping. 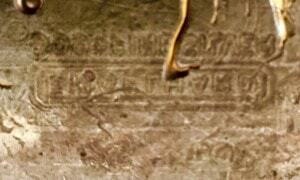 The obverse of this ingot measures 88.14mm x 38.34mm. 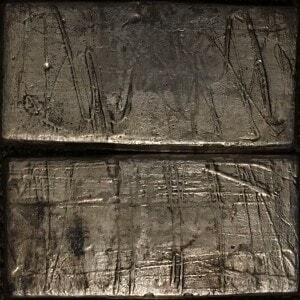 The reverse measures 84.81mm x 33.98mm. The height is 24.19mm. Differences in casting shape are observed in the photo below. 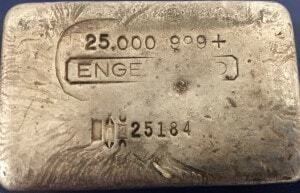 Ingot 59255 sold privately on January 9, 2017 for $3,500.00. 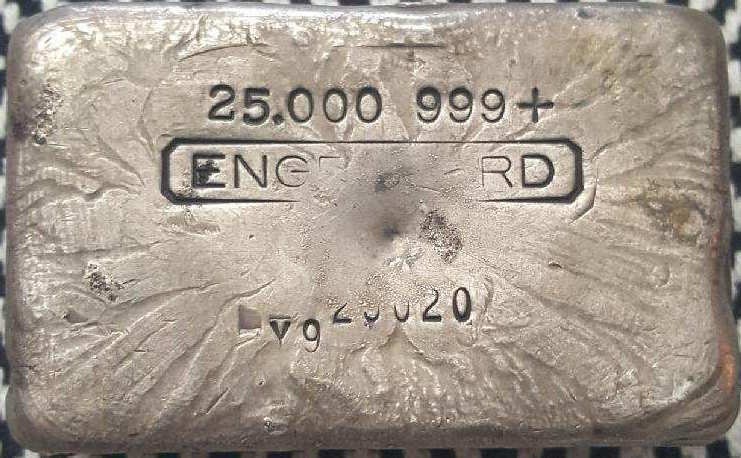 Ingot 59226 sold privately on February 20, 2017 for $3,750.00. 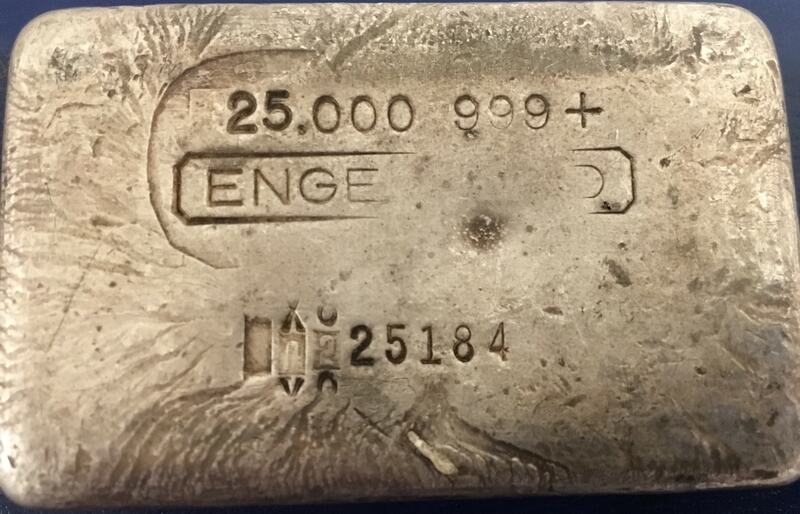 25oz Mid Hallmark [999+] [Serial Number] [Hallmark in Elongated Octagon] [25•000] Cast Finish 7th series 25oz ingot, flat bar variety. Possible Canadian variation due to floating decimal on weight stamp and placement of purity stamping. 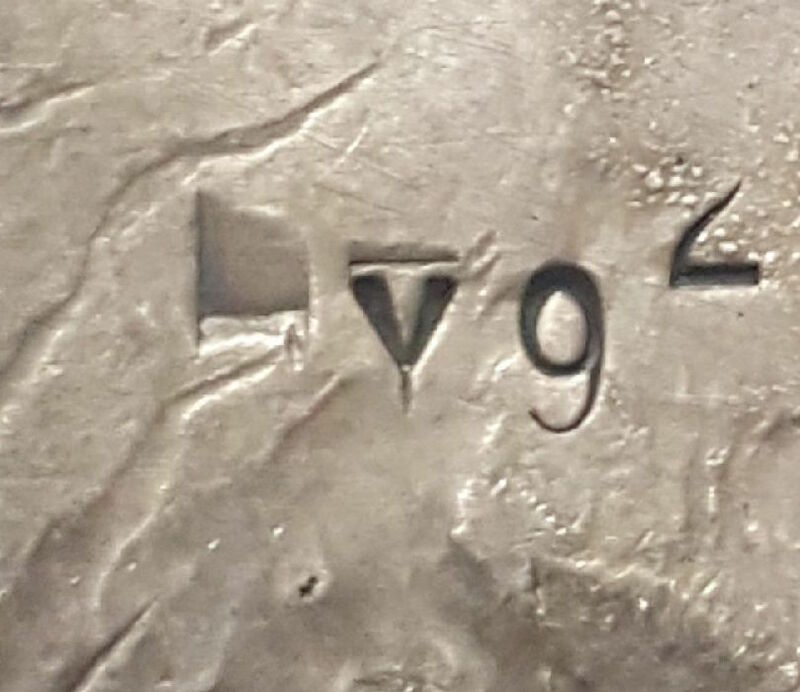 Important to note that on this variety, the first three numbers of serial assignment were stamped with the same three-digit gang stamp. 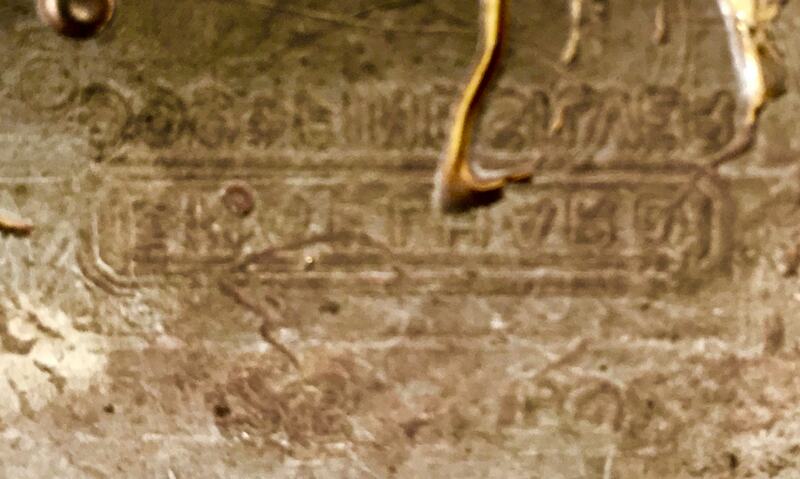 The last two digits were a separate stamping set and of a non-matching font. 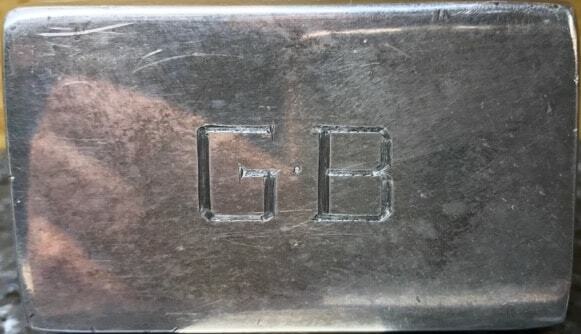 This is demonstrated in the pictures provided below, specifically the number ‘3’ digit on ingot 78373. Ingot 74656 sold for $1,560.95 via eBay auction on July 5, 2016. Ingot 77424 sold privately for $1,580.00 on November 28, 2017.